If there's one thing we pride ourselves on, it's finding the latest item on the cusp of It-dom and bringing it directly to your wardrobe—first. Whether it's the Gucci T-shirt craze or a pair of Mango shoes that superseded every other competitor in the market, we're dedicated. But now our attention is pulled in another direction, thanks to the fashion influencers we keep track of at all times. Head to M&S and zero in on the knitwear department. You're looking out for the fluted-sleeve jumper below, as modelled so perfectly by both Alex Stedman and Emma Hill only a day or so ago. Could this be a savvy follow-up for the girl who still laments missing H&M's cult favourite? You may recall this navy bell-sleeve sweater that went viral in an instant and sold out in a flash. Or could this be the brand's next pink coat or suede skirt? We think you'll agree, it has potential, and it will allow you to feel like you're stepping into spring without sacrificing yourself to pneumonia. 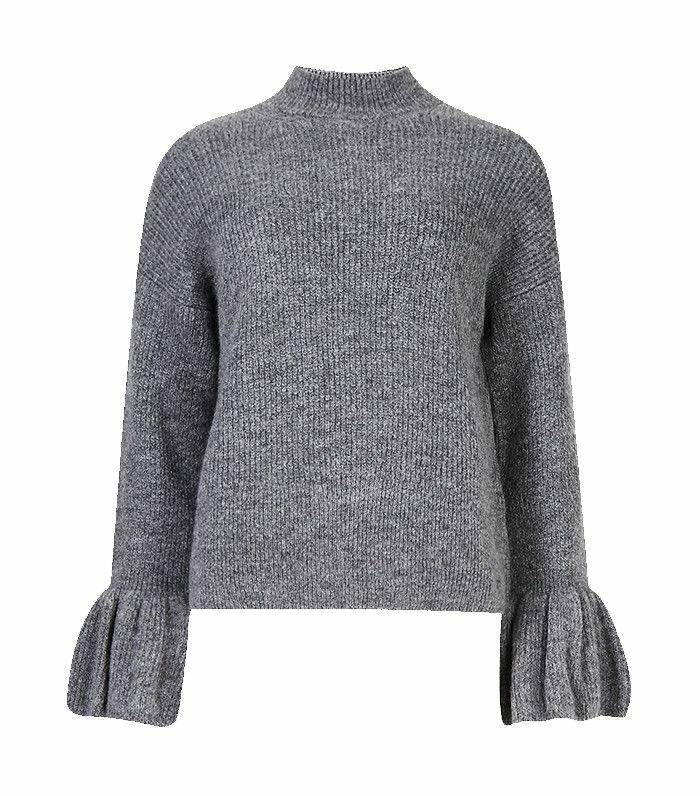 This knit looks perfect with jeans and a cosy coat with the sleeves bursting out from the hem. Very foppish. And so it goes into our baskets. Intrigued to buy this £35 steal for yourself? Be aware that it has a short hemline—a detail that we've noticed some super-fans have loved, but if you prefer a longer line, definitely try a size up. The question is, which colour will you get—pink or grey? Shop the M&S sweaters below, before they go. See more of this week's top new-in buys for your perusal.